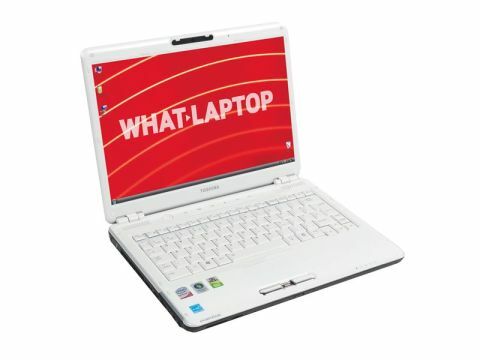 The Toshiba Portégé M800-106 has been designed for portable workers who want a stylish as well as powerful laptop. Weighing 2.1kg, this is a lightweight machine with a 13.3-inch Super-TFT screen. The screen uses LED backlight technology and images look bright and sharp. Such panels are thinner than standard fluorescent displays, so tend to flex when touched. Fortunately, Toshiba has added a slightly thicker bezel, which helps to add rigidity to the laptop. Graphics are handled by the integrated Intel GMA 4500MHD chipset, which is an improvement over the previous generation of chips, and offers native support for high-definition screens. That said, this machine has a standard 1200 x 800-pixel resolution, so doesn't take full advantage of the new chipset. The pearl white chassis is attractive and feels solid to the touch. The white is accentuated by the use of white LED lights to highlight the media buttons above the keyboard and to mark out the touchpad below. The buttons respond quickly and allow you to launch Windows Media player as well as to control DVDs. We were impressed by the quality of the stereo speakers, placed either side of the controls. You won't want to rely on them for all occasions, but they are certainly better quality than the average laptop speakers. This is due, in part, to the use of Dolby Sound Room technology, which is incorporated in the M800. The keyboard is nicely positioned in the middle of the body and the keys are well spaced. The keyboard is mounted on a membrane, so there is a fair degree of bounce as you type. You'll also find the central keys are slightly higher than those around the edge, due to the mounting-clips being around the edges of the keyboard. This doesn't detract from the overall quality, though, as we found it a comfortable and responsive keyboard to use. The touchpad blends in with the design of the chassis and is quite small. It can be locked when necessary using the Fn and F9 key, which will appeal to those who need to type when travelling. The mouse buttons are made of silver coloured plastic and have a fingerprint scanner nestled between them. The buttons respond well and the scanner can be set up to launch your favourite programs at the swipe of a finger. The specification is built around Intel's Centrino 2 platform, so you'll find a Core 2 Duo P8400 processor, which runs at 2.26GHz backed by 4096MB of DDR2 memory. The Toshiba hard drive offers 320GB of storage space and runs at 5400rpm. Performance proved more than acceptable, with the base specification more than capable of handling our benchmark and real world tests. Being a portable machine, the battery life, under test, of 220 minutes, is also more than acceptable. This is a great laptop if you're looking for a sole machine to use both in the office and when travelling. Connectivity covers everything the typical user is likely to need. You'll find a VGA-out port for connecting to projectors in the office, while for home use you can use the HDMI port to hook the laptop up to a high-definition TV. There is also an eSATA port for connecting high-speed peripherals. Despite the low weight of the Portégé, there is also a DVD rewriter built-in.